When Will American Foreign Policymakers Learn From Their Mistakes in the Middle East? Former top UN diplomat Lakhdar Brahimi lays out how decades of naïveté about Arab societies, poor planning and post-conflict miscalculations have fostered a deep mistrust and lack of confidence in the United States. 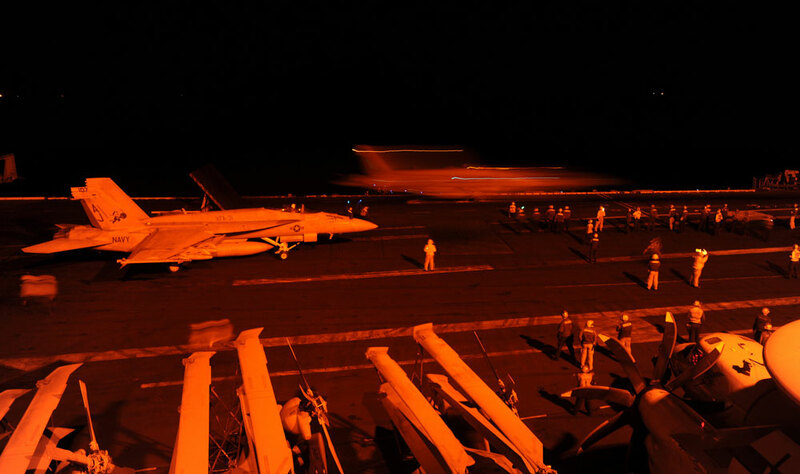 The United States is now bombing ISIS targets in Syria, opening a new front and possibly new dangers in the region. Lakhdar Brahimi, the UN’s top diplomatic troubleshooter for more than two decades, argues that a series of critical American mistakes in the Middle East since 9/11 have brought President Obama, a reluctant warrior, to this point, with no sign that American policymakers have learned from the past. Our UN correspondent, Barbara Crossette, spoke with Brahimi in Paris. The United States, now expanding its war against the formidable, ruthless fighters of the Islamic State, has found Arab nations willing to join the campaign in their own self-interest, but the base on which the coalition is built is not a very solid one. More than two decades of American naïveté or misunderstanding of Arab and other regional societies, astonishingly poor planning and post-conflict miscalculations that undercut claims of success, have left a deep mistrust and lack of confidence in the United States, in the view of the United Nations’ most experienced and savvy international envoy, Lakhdar Brahimi, who worked closely with Americans in Iraq in 2004 and Afghanistan in 2001–04. Brahimi was the UN-Arab League special representative for Syria from 2012 until early this year. Brahimi, now 80, speaking in an interview from his home in Paris, said that, like it or not, “the Palestinian issue is still important for all of us in this region. This is a very, very big part of the story. Anything on the Palestinian issue is decided by the Israelis. It is a mistake to go to the Americans: Please come and help us with this problem. They cannot. They are not allowed to. We need Americans. They have a huge role to play. But they cannot be an honest broker.” Not that there have never been laudable American efforts to find solutions, he said. “I had an opportunity to hear [Secretary of State] John Kerry speak of what he was trying to do to help solve that [Palestinian] problem,” Brahimi said. “That was just over one year ago. I was profoundly impressed at how much work he had put into the exercise, how he was genuinely trying to be fair and impartial. But I had no illusions: the present Israeli Government and the formidable machine supporting them in the US. shall not allow him to succeed. That is why I say the US cannot be an honest broker.” He recalls the day when Condoleezza Rice, as secretary of state, was forced to veto a resolution on the Middle East that she had personally negotiated in the Security Council after Washington got a call from Israel opposing the measure. Brahimi began to question seriously the effectiveness of American strategic thinking about the West Asia–Middle East region in the 1990s, when the neocons in Washington began to pressure first the Clinton administration and then President George W. Bush to take down Saddam Hussein, the Iraqi leader, whom the US had supported during his disastrous and opportunistic eight-year war with Iran in the 1980s. But the Iraqi invasion of Kuwait in 1990, the subsequent first Gulf War and the long ordeal of disarming Iraq that followed—during which Brahimi was called in as a UN adviser to the secretary-general time to time—had hardened conservative opinion, and Saddam loomed ever larger as a target. Brahimi was working in Afghanistan in 2001 when the attacks of September 11 sent American bombs and eventually troops in to Afghanistan. But that commitment to Afghanistan was superficial from the start, he observed. “We discovered that in fact from day one—from the 14th of September—the Americans were not really interested in Afghanistan,” he said. It was only a matter of time before the Bush administration finally went for Iraq, their prime—and to many, inexplicable—target. The invasion of Iraq and what followed lies at the root of all that has gone wrong since in that neighborhood, Brahimi said, and the record of the United States may appear as one of the colossal blunders of recent history. It left Iran in a much stronger position than it had been in decades, and opened the door to the violence now tearing Iraq apart. “When they invaded Iraq, they didn’t seem to have planned anything for post-invasion,” Brahimi said. “They weren’t really ready. The net result of their invasion, if you look at it from where we are now, is that the Americans—the Great Satan in person—helped Iran get rid of their worst enemy in the region: Saddam. They did better than that, as far as Iran was concerned. They put in charge [in Iraq] not only the majority Shia, which is understandable, but of the people who were there amongst the Shia leaders, they looked like picking up only the friends of Iran. So without exaggerating too much, you could say that the Americans got rid of the Iranians’ worst enemy, and then they handed Iraq to Iran on a silver platter. Another, catastrophic unplanned outcome of the war against Saddam was the alienation of the hastily and carelessly dismembered largely Sunni Iraqi army, without much thought that some of these soldiers and officers would regroup to join the fight against the Shia government. To make matters worse, Brahimi said, the Americans did not collect Saddam’s weapons, which were there for the taking when ISIS began to move into Iraq. Brahimi said that the Islamic State—which he calls Daesh, the Arabic acronym for the organization’s full title—was Iraqi from the start, a fact that may be getting lost in the present emphasis on its Syrian bases. Naivete and the resulting sketchy picture of the Arab region as all part of a unitary Arab World led to more miscalculations after 2011, when protests broke out in North Africa. The whole concept of an “Arab spring” seems to have been a Western invention, he said. It led Americans to an unconscious resurrection of the domino theory. After the fall of governments in North Africa—Tunisia and Egypt in particular; Libya was a different case altogether—American officials began to expect Bashar Assad’s Syria to go down next. In Libya in 2011, numerous countries have consistently argued, European and American governments tricked the UN Security Council into authorizing military regime change in the guise of humanitarian action, adding to mistrust of Western powers. “When the situation in Syria came along, they thought, ah, he is to follow the route of Mubarak and everybody started shouting, Bashar will be out! In hindsight, Brahimi said, “I think it was not the proper thing to do to personalize things. Syria is a big and complicated country. They definitely need change and maybe if the regime gave way to a totally new regime, I think that would probably be acceptable to the majority of the Syrians. But to put all the emphasis on one man was not the right thing to do. Anyway what we have now is that Daesh is seen as the bad guy, more than Bashar is, and the thing is, How are you going to get rid of Daesh but not strengthen the hand of Bashar Assad? “When we speak of the Arab world, yes, there is something of an Arab world,” Brahimi said, surveying the region. “People speak the same language, they are members of the League of Arab States, divisions between countries are artificial, people are very close to one another across borders. So an Arab world exists, but Arab states also do exist. And these Arab states have existed long enough to have very different and specific situations.” In that period outsiders still call the Arab Spring, countries across North Africa had markedly differing experiences. Of the three important countries in the Maghreb—Tunisia, Algeria and Morocco—Tunisia surprised the region by being first to change its regime radically, driving President Zine al-Abidine Ben Ali, despite his extensive security services, out of office and out of the country in a few weeks after protests broke out at the end of 2010. Egypt followed with the fall of Hosni Mubarak in early 2011. In all of these countries, Islamic parties had their own policies, though all may have links with the Muslim Brotherhood, Brahimi said. In Tunisia and Morocco, Islamists parties have so far kept to their promises of honoring the principle of multiparty democracy. “And then there are the Egyptian Muslim Brothers, who promised not to run for all the seats in Parliament, not to have a candidate for president—and they didn’t keep those promises,” he said. “They had candidates in every single constituency, and they ran for president and of course won.” That unpopular and autocratic president, Mohamed Morsi, was overthrown in 2013 by the army. General Abdul Fatah al-Sisi is now president. What’s next for Egypt?